The first time you discover how to fret a chord on your banjo is a very big moment in your burgeoning playing career. Whether you’re blazing through a banjo breakdown or accompanying a campfire singer, chords are essential to playing the banjo. Here, try to master the three basic chords used in thousands of songs. If the world suddenly seems like a much better place after you’ve successfully fretted each of the chords in this section, that’s a good indication that you were born to be a banjo player. After you’ve mastered each chord by itself, try moving from one chord to the next, in any order that strikes your fancy. 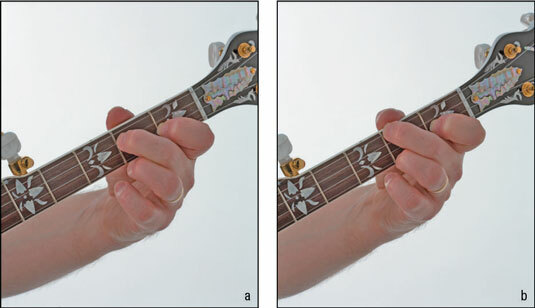 Strum with a downward right-hand thumb motion across all five strings a few times for each new chord and strive for a clear, ringing sound from each string for all three chords. Try to keep the tips of your left-hand fingers close to the neck and pointed towards the fingerboard at all times as you move from one chord to the next. At first, you may have to move one left-hand fretting finger at a time as you work the different chord fingerings into your motor memory. However, in the long run, fretting all the strings you need for a chord at the same time is more efficient. After you’ve mastered this skill, you can switch between chords with greater speed and accuracy. Although people very seldom associate the banjo with Zen, you really don’t have to fret anything at all to play the G chord, grasshopper! A G chord is just the sound of your right hand strumming the open strings in G tuning. You could use your left hand to wave to your adoring fans, but I think it may be a little early for these kinds of grand gestures. For the D7 chord, you place your middle finger just behind the 2nd fret of the 3rd string and your index finger behind the 1st fret of the 2nd string. Try strumming down across all five strings with your right-hand thumb, starting with the 5th string and striking each note down to the 1st string. Try a slow strum to check the accuracy of your fretting on each individual string, but then don’t be afraid to go wild with some fast strumming to strut your stuff! The C chord is a bit harder than the D7 chord (see the preceding section) because you use one more left-hand finger to fret this chord. Here, the left-hand index frets the 2nd string, 1st fret — just as with the D7 chord. However, now you move your middle finger to the 4th string, 2nd fret, and you also need to fret the 1st string at the 2nd fret. Be careful that you fret the 4th and 2nd strings with enough of a vertical angle with your left-hand fingers so you don’t block the sound of the open 3rd string. Your hand should look something like this figure when you fret the D7 and C chords. Here’s how your hand looks fretting the D7 (a) and C (b) chords. Note the position of the thumb. Seeing is believing, so if you’re having trouble figuring out how to fret these chords, take a look at Fretting and Changing Chords, which includes left-hand technique tips and how to fret the C and D7 chords.